As secretary of state, Brian Kemp is also chair of the State Elections Board. So what happens when a complaint comes in about the current gubernatorial race, where Kemp is running as the Republican candidate, such as a recent one from the NAACP? Brian Kemp speaks after winning the Republican gubernatorial runoff in July. Working double-duty as both Georgia Secretary of State as well as Republican candidate for governor, Brian Kemp has fielded plenty of criticism from his opponents for refusing to leave office. Is there a conflict of interest? As the secretary of state, could he work the state elections code in his favor in the gubernatorial contest? How is he able to hold down the full-time state job while campaigning every day? These are the questions coming from Democratic officials—including his general election opponent Stacey Abrams—and progressive Georgians who want him to step down as secretary of state. Although there’s no law on the state’s books that says a secretary of state running for office must resign from the position, there are statutes that preclude the chairman of the State Elections Board, which is currently Kemp by statutory default, and its board members, if they’re politically involved, from participating in procedures that could affect how elections rules are enforced. In 2010, when now-Congresswoman Karen Handel ran as the Republican nominee for Georgia governor, she stepped down as secretary of state. When former Secretary of State Cathy Cox, a Democrat, ran for governor in the 2006 election, she stayed in her post, but recused herself from involvement with the elections board and appointed a replacement to “avoid the appearance of a conflict of interest,” she told Atlanta magazine. 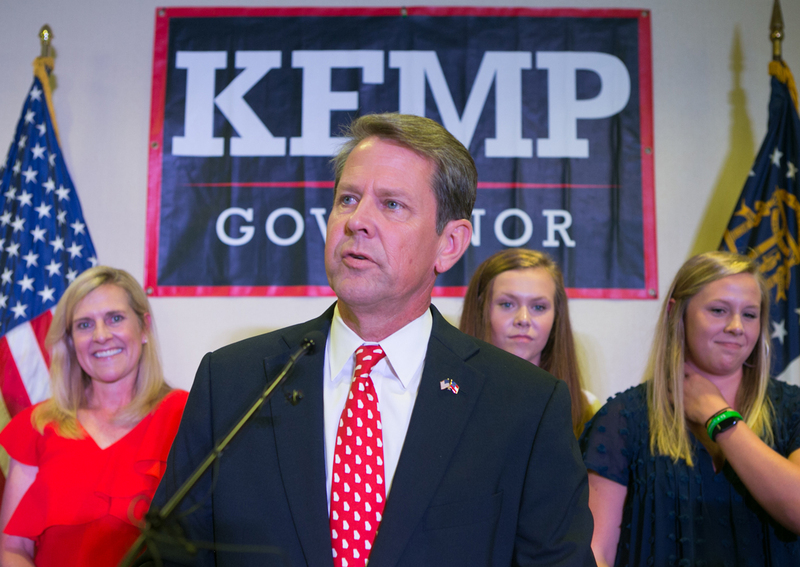 Kemp has kept all three positions—secretary, chairman, and candidate—although he’s seemingly laid low as leader of the State Elections Board. Of the five board meetings conducted since Kemp announced his candidacy in April 2017, he’s attended two, and didn’t say a word during the September 20, 2017 meeting, according to a transcript. Kemp’s campaign and office say he’s still been carrying out all his responsibilities as secretary of state from the campaign trail, according to the Atlanta Journal-Constitution, but a recent complaint filed with the board about elections system security has called into question what roles Kemp is allowed to carry out as secretary of state. On October 24, the Georgia branch of the NAACP filed a State Elections Board complaint against the secretary of state’s office and four county elections boards, claiming there were polling machine issues in multiple counties that improperly selected Kemp’s name when Abrams was meant to be picked, in addition to other alleged computer glitches. The complaint said that voting machines in Bartow, Cobb, Henry, and Dodge Counties had malfunctioned in such a way, whereas, “In other instances, machines showed ballots being cast before the person actually voted,” an NAACP news release added. “So far, all claims have been unsubstantiated, and we have not gotten any reports that ballots have been cast for the wrong candidate,” said secretary of state spokeswoman Jessica Simmons. (Secretary of State spokeswoman Candice Broce said Kemp’s office has also received two complaints of Kemp selections being converted to Abrams picks.) Kemp heads the board that would review such allegations. But can he lawfully participate in this investigation and others like it? It’s safe to say that Kemp has endorsed himself in the race for governor. And because the NAACP didn’t specifically identify him as an alleged rule-breaker in the complaint of what the organization called “possible voter suppression tactics,” Kemp could play a role in determining if this claim, or others, warrants a full-fledged investigation. Typically, an elections complaint is first referred to the secretary of state’s office, whose investigators review the matter and bring it to the attention of the State Elections Board. From there, the board decides if there’s probable cause to launch a formal investigation that will loop in the state attorney general’s office, according to David Worley, a State Elections Board member. “The attorney general’s office can either negotiate a penalty with the respondent or, if the respondent is not willing to do that, they can refer the case to an administrative law judge who hears the case and makes the decision,” Worley said. The State Elections Board then must determine if the attorney general’s recommendation should be accepted, modified, or rejected, according the secretary of state’s office. That means, at some point, Kemp could play a role in determining if the NAACP’s complaint of faulty voting machines—or other complaints in the future—carries water. Then, if the investigation of the complaint escalates to the point that it warrants a judge’s input, the board he chairs will have the final say in how to resolve the matter. Former President Jimmy Carter is the most prominent Democrat to call for Kemp to resign as secretary of state. “In order to foster voter confidence if the race ends up very close, I urge you to step aside and hand over to a neutral authority the responsibility of overseeing the governor’s election,” Carter wrote in a statement published by the Associated Press on Monday. And complications with the NAACP’s complaint don’t end there. The elections board code of conduct also prohibits members from participating in board matters if they’ve made financial contributions to the campaign of “a respondent, complainant, or witness.” Yet three of the four board members have donated to a gubernatorial candidate. Board members Seth Harp and Hon. Ralph “Rusty” Simpson, a former Superior Court judge of the Tifton Judicial Circuit, have each donated at least $1,000 to the Kemp campaign. If Kemp was, in fact, a respondent, that would leave just Rebecca Sullivan, the board’s vice chair, and Worley eligible to review—and ultimately make a final determination in—the NAACP’s complaint. And Worley has given $1,000 to Abrams’s campaign. Worley said that, if the respondent to the complaint was indeed Kemp—and not the secretary of state’s office and the individual elections boards of the counties cited in the charges—Worley would recuse himself from involvement in the investigation process, “even though that’s not what the strict terms of the rules say,” making Sullivan the only member who could carry out the board’s duties for this case. He said he wants to avoid the “appearance of a conflict of interest” cited in the code of conduct. Former Secretary of State Cox told us that she didn’t wait around for a potential conflict of interest to arise with her chairing the State Elections Board. “Even though I knew in my heart that I could play a neutral role, I knew that there would be, at a minimum, an appearance of impropriety, and that was an important aspect of maintaining trust and integrity in the system,” she said. “I didn’t want to go there. I didn’t want those kind of questions to be raised.” She added that it would be inappropriate for her to have access to investigatory information that could impact how her or her political opponents secured votes. “I think the higher calling as a board member is to remain neutral and to maintain a position of objectivity,” she said. Investigator Pamela Jones had reached James Callier, clerk of Dodge County, where, according to the NAACP’s claim, a voter claimed a polling machine was casting multiple ballots when they tried to vote. Callier told the secretary of state’s office that the machines don’t generate an error message that would indicate something like this had happened. The same day, Deputy Chief Investigator Frances Watson, of the secretary of state’s office, had begun corresponding with Cobb County Elections Director Janine Eveler to find out if a voter’s claim that the polling machine’s touchscreen was wrongly picking Kemp, instead of Abrams. Eveler said none of the county’s polling locations had heard any issues of the sort, and that the claim could not be substantiated. Another voter who claimed their vote was not registering properly was told their long fingernails were likely the source of error. When pressing the screen with their fingertips, the concerned party’s ballot was properly cast. Watson, that day, also contacted Bartow County Elections Director Joseph Kirk in an effort to investigate another voter’s concerns about a polling machine’s functionality. Investigators were unable to reach the supposed voter complainant, but the voting computers were recalibrated nonetheless.